The Thunder Stick is an item in Mario Kart Arcade GP, Mario Kart Arcade GP 2, and Mario Kart Arcade GP DX. Upon using the Thunder Stick, the racer will begin to repeatedly swing it for approximately 5 seconds. If a rival gets too close to the attacking racer, the rival will get zapped, spin out, and be brought to a complete stop. 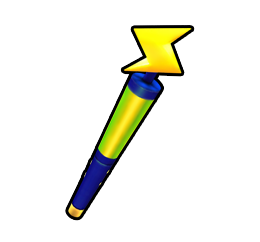 A variant of the Thunder Stick known as the Thunder Stick+ exists exclusively in Mario Kart Arcade GP. This variant extends the duration of the attack by around 2 seconds. Similar items include the Hammer, the 10T Hammer, and the Giant Pencil. This page was last edited on February 26, 2019, at 01:12.